We are preparing for our summer road trip to Pennsylvania. Google Maps suggests that it should take 13 hours, but we find that it varies between 14 and 16 hours. 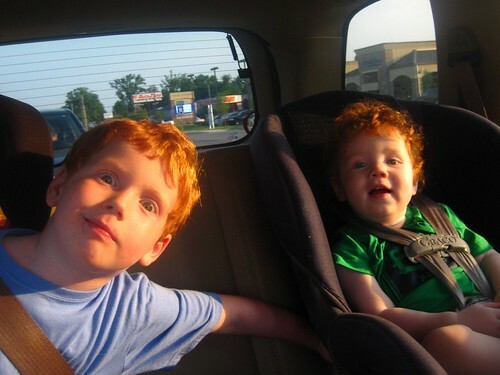 It all depends on how restless the boys get. Or maybe how many Chipotle restaurant stops we make. It’s definitely one of the two. One thing I’ve learned in the seven years we’ve been doing this (at least twice a year), is that the boys need to be distracted or things go downhill very quickly. We allow them to watch movies and play on various gaming devices, but I really prefer that they do something that requires them to use their minds. I was really excited when I found this Travel Bingo game the other day at Growing Tree Toys. Alex will really get into the hunting and finding (and winning) aspect of it, while Declan will likely just make circles all over the bingo card. Either way, they will both be engaging their brains and I will happy! Does your family make long road trips? How do you keep your kids from “are we there yet? ?” only 3 hours into the long journey? Alex lost his first tooth in February of this year. It had been hanging on by a thread for nearly a week before we convinced him to let us help things along. When the excitement was over, I thought for sure he would run right upstairs and put the tooth under his pillow, but he asked for a sandwich bag instead. He put the tooth in the bag and put the bag away in the junk drawer in the kitchen. I asked him what his plans were for the tooth and he said that he wanted to save it for a bit. More teeth jumped ship and after two months, we had a collection 5 teeth in the drawer. 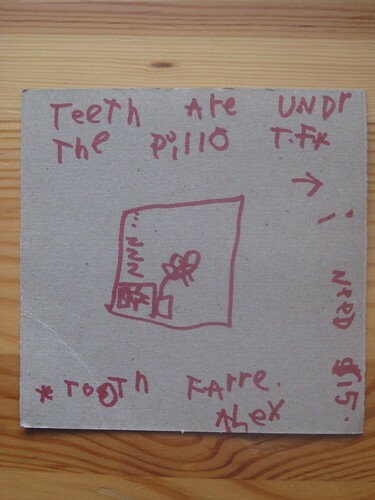 One afternoon, Alex announced that he was going to “test” the tooth fairy that night. He planned to place one of his saved teeth under his pillow to see if she would notice. If his test was successful, he planned to place the rest of the teeth under his pillow the next night for “the big payout.” I honestly don’t know where he comes up with this stuff. So, bedtime came that night and it was one of the quickest and easiest bedtimes ever – go figure. When he woke the next morning, the tooth was gone and there was money in its place. Success! Alex disappeared for a bit and came back with two notes to show me. The first was a map for the tooth fairy. That night was the big payout and he wanted to be sure she knew where to find those teeth. He also clearly stated his expectations for the exchange. You can see below that “I need $15.” Uh-huh. 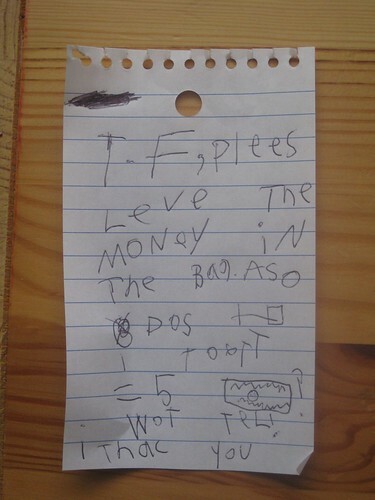 In his next note, Alex left the instructions on where to place the money. He also tried to pump the tooth fairy for information. The note says, “Also, does one tooth equal $5? I won’t tell.” She didn’t answer him that night, but she did exchange the teeth for some more money. The first tooth of the next wave came out the other night at dinner. I’m anxiously waiting to see how this round with the tooth fairy will go. Does your family have any special tooth fairy celebrations? It was hot this weekend. It’s always hot in Alabama in the summer, but this weekend brought us temperatures in the mid-90s and a heat index of 105 degrees. We don’t usually see that until mid-July, after we’ve had a chance to build up a bit of a heat tolerance. 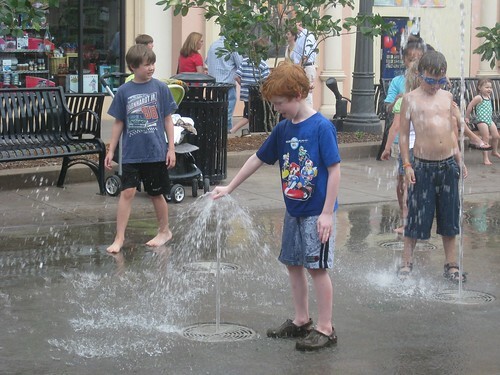 Since we were already at Bridge Street, we let the boys have a little fun in the fountain park they have there. It was pretty crowded, but the boys both had some fun. 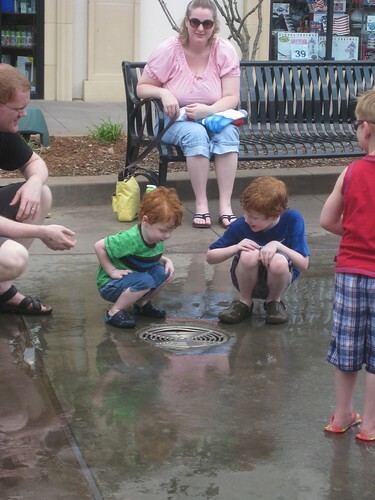 I really try to let them just do their thing, but I find myself on a constant repeat of “don’t run, walk please, please don’t run” as they move from fountain to fountain. I saw several kids slip on the concrete and fall while we were there. None of them were hurt, thankfully, but I wonder if there might be some kind of non-slip padding or texture that could be added to this area. We hear “that’s not fair” a lot around here. Often, that just means Alex doesn’t like something we’ve said, but sometimes he’s right. How do you handle things when friends of your children have rules at their homes that are significantly different than the ones at your house? We’ve had some incidents in our neighborhood recently that have shown us that not all of the parents in our neighborhood are on the same page with what appropriate behavior is and I wonder if any of you have faced the same thing and how you handled it. Share your thoughts and experiences, please! 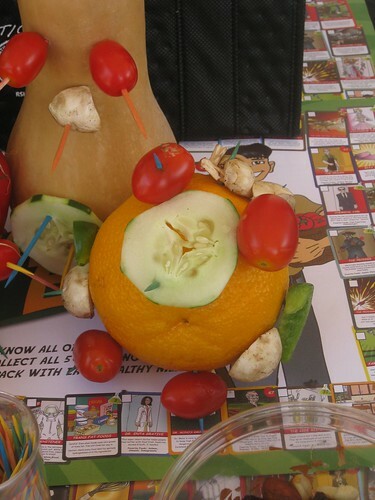 Fun with Fruits and Veggies! Several weeks ago, a new Earth Fare store opened in our city. If you aren’t familiar with Earth Fare, they are the healthy supermarket. My family was SO excited when we heard they would be opening here! We try hard to make smart choices with our shopping, but it’s sometimes difficult given our limited choices at the more traditional grocery stores we have. Earth Fare makes it very easy for me to pick the healthy option. They won’t even sell products in their stores that contain trans fats or high fructose corn syrup! (You can check out their food philosophy here to see the other ingredients/processes they will not sell.) So, on the rare occasion (ha!) when my children are hanging like monkeys from the shopping cart and I’m just grabbing what I can from the shelves, I can be assured that my purchases might not match my list, but they will be healthy. Anyway…even before the store was open, Earth Fare partnered with Bridge Street (our local outdoor shopping area) for an Earth Day celebration. They had children at the event sign pieces of iron that would later be turned into a sculpture that was specially commissioned by Earth Fare. 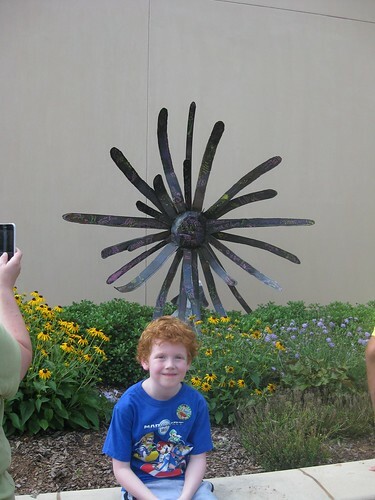 The unveiling of the sculpture was this weekend and we were there! It’s hard to tell from this photo, but the petals all have the signatures of children who were at the Earth Day event. 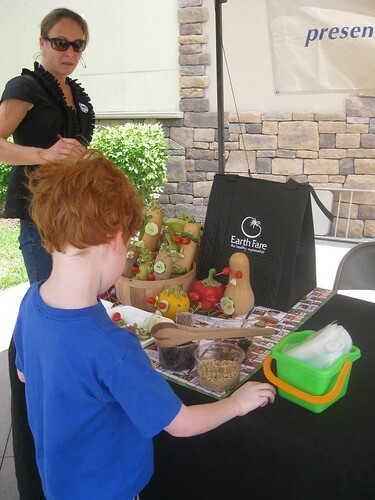 As part of the unveiling festivities, Earth Fare had a fruit and veggie face making contest. Alex was very excited and spent a great deal of time picking out just the right features for his face. While Alex worked hard on his face, Declan was VERY excited by the seed-planting station they had set up. 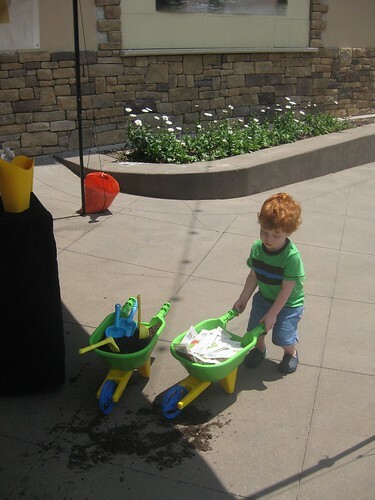 I’m sure the original intent was to actually plant seeds, but Declan much preferred to push the wheelbarrows around. Alex eventually finished his face and submitted it for the contest. You might be able to see some of his “specialty features” in the photo below: mushroom eyebrows, tomato eyes, and tomato feet. He didn’t win, but he was very proud of it and so were we! We hung around Bridge Street for a bit after the judging for some fountain park fun. I’ll share some of those photos tomorrow! I started making seasonal pillowcases for my older son a couple of years ago. It was originally just a Christmas thing, but quickly became a good excuse for me to stockpile cute holiday themed fabric. There aren’t a lot of holidays in the summer, so I made a few random and cute ones for those months. I started with a simple pattern from somewhere, but I’ve changed it here and there over the years. Alex has a standard pillow on his bed, but Declan still uses the toddler-size pillows so I modified the pattern for the smaller ones. These are really simple to make and would make a great project for a beginner or as a project to work on with the kiddos. 1 yard of cotton fabric for main section – if you’re using a pattern that has a directional design, you will need more than one yard to get the correct size of the main section facing the right way. Wash and dry your fabric just as you will when the pillowcase is part of your normal laundry routine. This will allow most of the shrinkage in the fabric to happen before you sew. It’s always frustrating to me when my seams end up all wonky because I was in a hurry and skipped this step. Press the cuff fabric in half lengthwise, wrong sides together. Lay main fabric on a table, right side up. Match the long raw edge of the cuff fabric (not the folded edge) with the long raw edge of the main fabric. Pin in place. 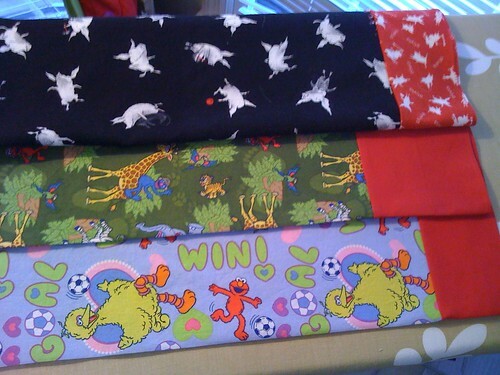 Sew these two layers together with a 5/8″ seam. Press the seam you just sewed toward the cuff side. Fold the pillowcase in half, right sides together, and sew along the bottom and open side using a 1/2″ seam. Turn down the cuff so that the folded edge you pressed is on the inside of the pillowcase. Pin in place and turn right-side out. Stitch “in the ditch” (That’s just the area where the two fabrics come together). This should catch the folded edge on the inside and will look neater. Press the finished pillowcase and enjoy! If any of this doesn’t make sense, please let me know. I tried to write it out logically as I went along, but there may be something in there that I missed. I’d love to see photos if you make some of your own! Get your Dad to the Doc! I learned some startling statistics today. Did you know that men are 31 percent less likely than women to have visited a doctor in the last year? Men are also 30 percent more likely than women to have neglected their cholesterol tests. High cholesterol is a leading factor in heart disease, which is the leading cause of death for men in the United States. High blood pressure is another factor and both can be easily detected, monitored, and treated. The key to all of those things is to get men to their doctor! I don’t know about you, but the men in my family think doctors are great — for everyone else. When I was growing up, I remember my grandfather telling my mom to take me to the doctor for some cough or cold. When he caught the same thing from me, I told him he should go see the doctor, too. Guess what he said? “No, I’ll be fine.” Funny, it was important for me to go see the doctor, but not for him — for the same problem! So what can we do to help the men in our lives get to the doctor? The U.S. Department of Health and Human Services’ Agency for Healthcare Research and Quality (AHRQ) and the Ad Council have launched a program to help men figure out which preventive tests they need to have and when they need to have them. You can visit the Dad to the Doc website and send the men in your life a free Father’s Day e-card. It’s a friendly way to let them know that you want them to take care of their health so they will be in your life for a long time. You can ask your husband, father, brother, uncle or grandfather to visit the Healthy Men website. This is where they can learn all about preventive care and staying healthy. The site provides guidance on what questions to ask doctors, what some common tests are and when they are given, as well as a glossary for medical terms they might not be familiar with. Finally, while they’re at the Healthy Men site, ask them to take the health quiz. It’s a simple quiz, but might point out that they aren’t doing all that they could be to monitor their health. Will you join me in encouraging the men in your life to protect their health and get regular preventative care? I hope so! 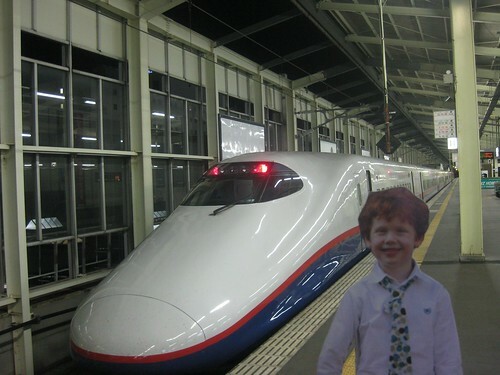 Flat Alex and Declan go to Japan! My husband had the opportunity to travel to Japan a couple of weeks ago. As much as we would have loved it, it wasn’t practical (or in the budget) for the entire family to go. Instead, Flat Alex and Flat Declan made the trip in a suitcase! You may remember when Flat Alex went to Europe and this trip was similar, but Declan got to go, too! 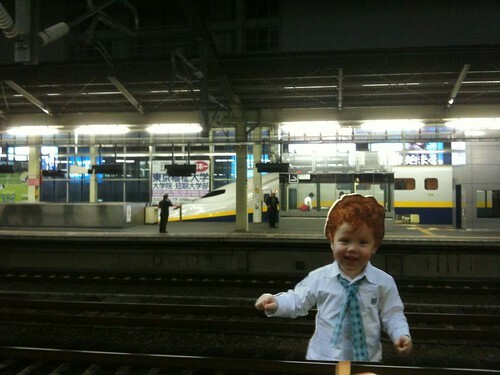 Here is Declan, happily waiting for the arrival of the train. He loves trains in real life and I can only imagine how crazy excited he would have been if he was actually there! I wonder what kind of train they were waiting for? Ah, there it is, a shinkansen train! 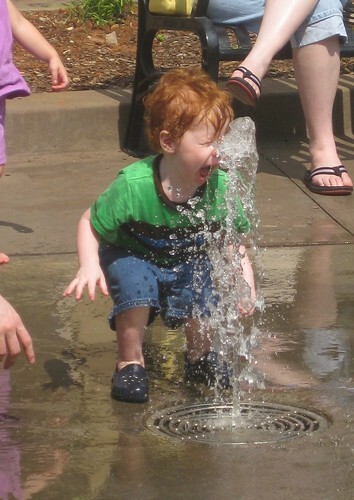 Alex wants to ride on a bullet train in the worst way and asks if we can move to Japan so he can do this. I don’t think he really gets that you don’t just take one to get groceries when you live there, but I’m glad he has a desire to travel. We do hope to be able to take the boys there one day! 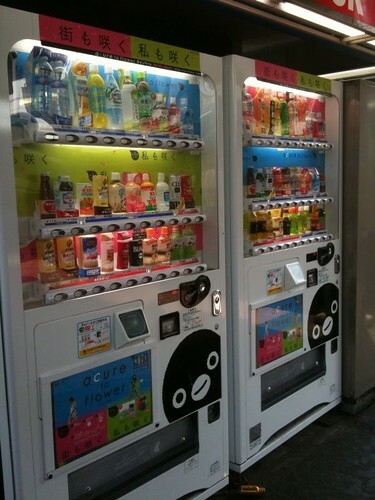 One last photo of one of my favorite things – Japanese vending machines. They were everywhere when I was there and you can purchase all kinds of things from them. This one had my favorite drink in it, so my husband snapped a photo for me. It’s kind of hard to see, but third from the left in the top row of the first machine is Lemon Water. It’s so good! Lemon Water folks, if you happen to find this post, please export your stuff to the US! Summer is in full swing around here, but the last several days have seen off and on rain and storms. The boys have been disappointed that they couldn’t go outside, but we used some of the rain delays to get a start on our summer reading. We read a lot normally, but the incentive programs provided by many bookstores give an added element of fun. Who doesn’t love free books?? We’re participating in the Barnes and Noble Summer Reading Program, which requires Alex to read eight books in order to choose one free book. 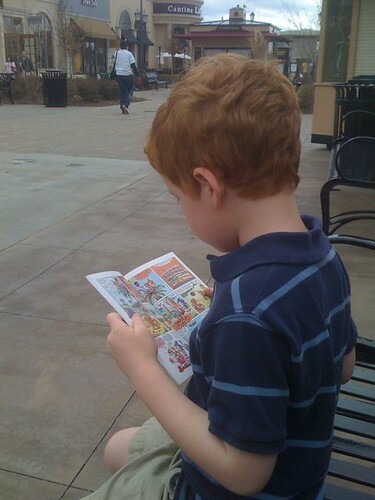 He’s a pretty fast reader and is already halfway there! Barnes and Noble also provides a lot of great downloadable activities to go along with the program. 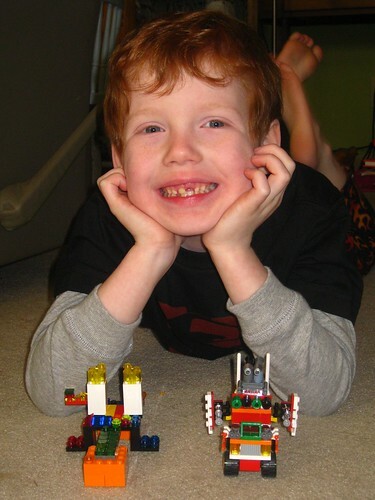 Some of his favorites are the Geronimo Stilton books and the Magic Tree House series. If your kids also enjoy the Magic Tree House series, you will want to check out the Magic Tree House website, where they have an entire Passport to Adventure planned this summer. You can print out a passport for your child and earn stamps for each book. You can even enter to win a Magic Tree House for your own backyard! What books are on your child’s summer reading list this year?